Grant, Dave, Kevin, Cory and Jayme from the Green Bay area chartered the Top Shot Sportfishing charter boat team to do some deep-sea charter boat sport fishing in Fort Lauderdale, FL. We started the charter trolling the reef in 120 ft. of water north of Fort Lauderdale, 1.8 miles from shore. The guys were looking for action and some fish to put on the grill. I used a trolling spoon on one deep planner line and a sea witch on the 2nd deep planner line in front of a double hooked Bonito strip. I worked the area from 100 ft. of water out to 200 ft. of water heading off shore north of Fort Lauderdale, searching for the school of fish. The first bite we got was on the planner rod with the spoon, and we caught a 10 lb. Black Fin Tuna. The mate, Joe, gaffed the Tuna and put it in the fish box on ice. We started catching Kingfish on the planner rod with the sea witch - they weighed about 10 lbs. each. I decided to try deeper waters around a wreck so I trolled that area and got a nice Black Fin Tuna. Next, we put up two kites using live Goggle Eyes for bait fish, targeting Sailfish. I also put out a Shark bait on the bottom. As soon as we got the bait down on the bottom, we got a bite – the rod bent over, but the fish pulled the hook. We sent another Shark bait down, and it happened again- a large fish bit the bait and got away. We picked up our fishing lines and relocated to another spot. We got the baits down again - this time the rod bent over but the fish did not get away - we had a big one on. Jayme was the angler and fought this large fish. After a great battle, a huge Bull Shark surfaced. He didn't want to come to the boat, and we had to leader him up multiple times. We snapped a couple of photos, and released this monster. Great job on the fish and good day fishing! It was now time to head back to the dock. The anglers retired into the a/c salon and enjoyed the relaxing trip back to the dock at Bahia Bar Yachting Center, 801 Seabreeze Blvd. Fort Lauderdale 33316. 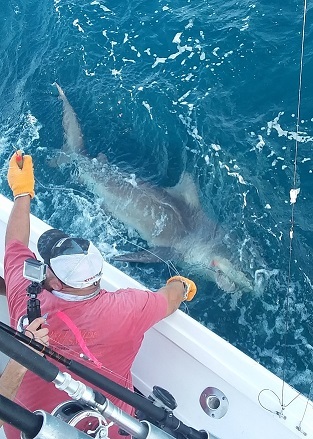 For a successful and adventurous deep-sea fishing charter in Fort Lauderdale FL for Sailfish, Shark, Bonito, Mackerel, Swordfish, Snapper, Wahoo, Tuna, Mahi Mahi and Grouper, contact Captain Zsak. - 954-309-7457 or email us at tzsak@bellsouth.net Website: www.topshotfishing.com.